This is a 2 - 3 year old coffee tree. Almost all coffee farmers harvest their coffee cherries by hand. It needs to be done in a fairly short period of time, as they may dry out in the tree or fall on the ground, yielding inferior quality. In most of Brazil, ripe cherries are first dried in the sun. This process produces coffees with less acidity and more body compared to the wet process. 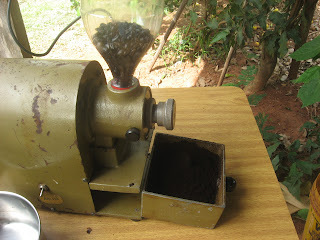 Processed coffee beans are the result of ripe coffee cherries which are harvested and processed to remove the skin, pulp, and parchment, but still not roasted. I learned to heat up the roasting pot first and then to load it with half of its capacity so to speed up the first batch. 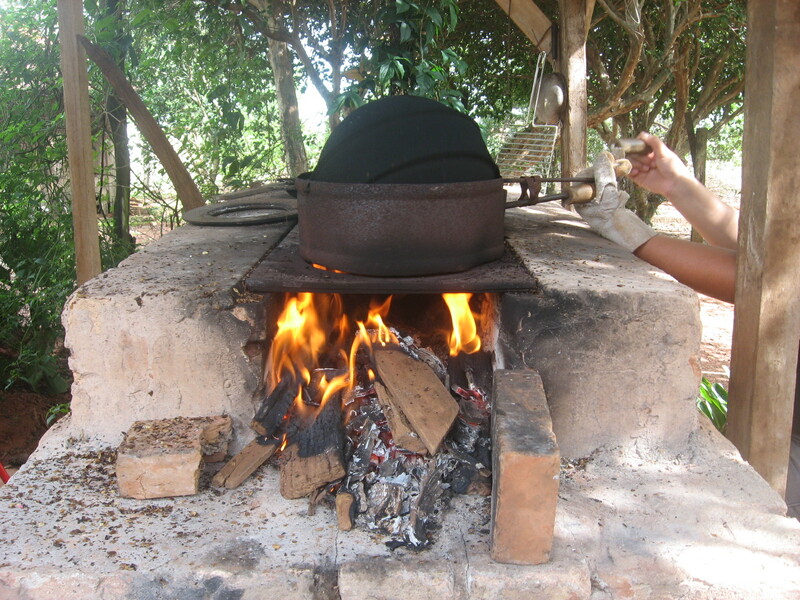 As soon as start smoking, there is a split second in which we need to take the pot out of flame to spread the coffee beans over a large sieve. 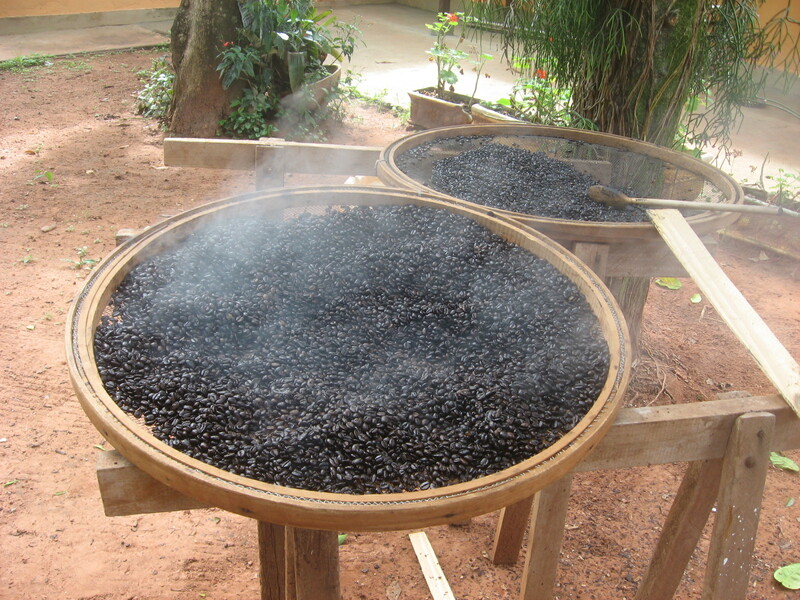 At this moment, the coffee beans should be covered with shiny oil and then they are perfectly roasted. 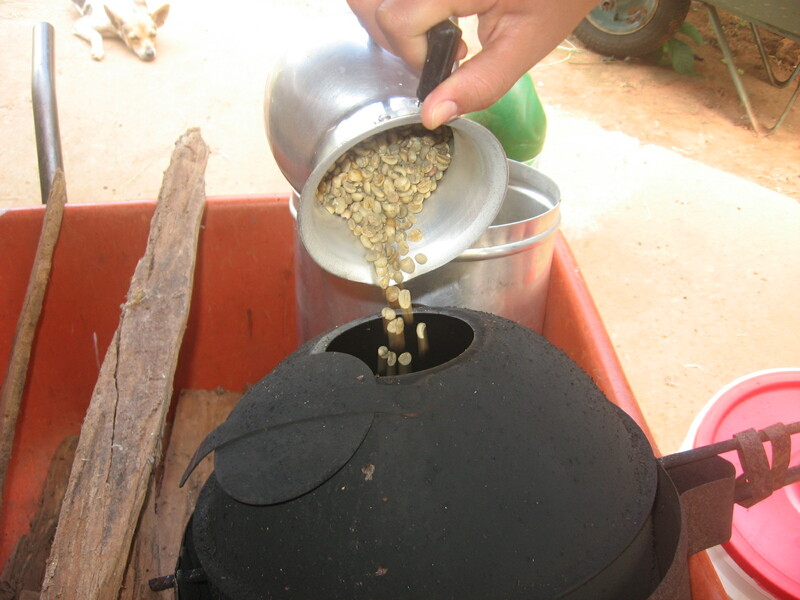 One needs to shuffle or fan the beans so not to over roast with their own accumulated heat. 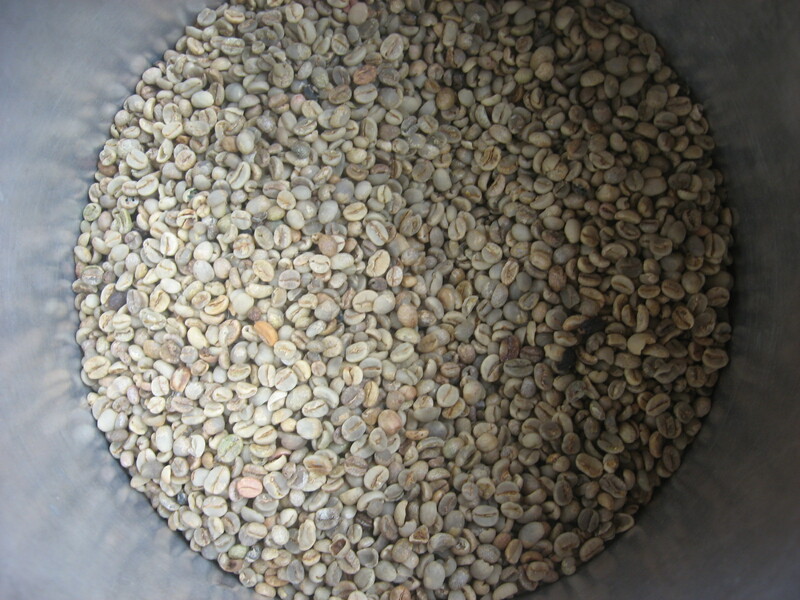 To achieve the perfection, I am learning to roast imperfectly batch after batch. This is a modern version of coffee grinding machine, an electric one. The older one is done by hand crancking device. 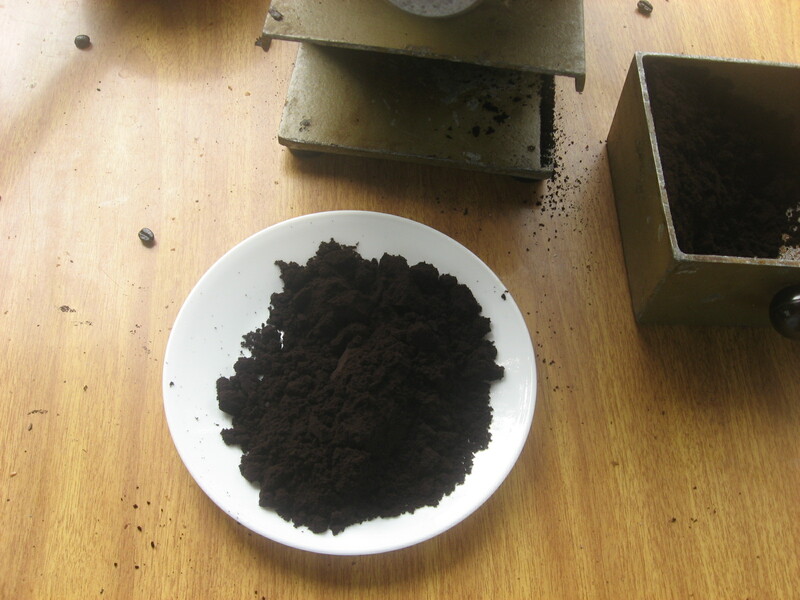 We like our coffee finely ground, with medium acidity and great body. We usually drink it strong and sweetened with cane sugar. Home roasted coffee is done only in rural areas where great amount of smoke can be produced. It is becoming rare as the time passes. Giving home roasted coffee is a good gift, and such a great one that everyone wants some. Just like any other things made by farmers´hands. 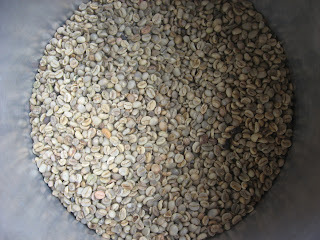 Ive recently gotten one of the round coffee roasters from Brazil as well as some green beans. Wonder what tips you might give me to shorten the journey to a palatable cup, thanks..
Hi, sorry for taking a while. Too busy roasting coffee!!!! OK, I have made a few mistakes in the past, but I finally learned that I need to smell the smoke as if it was freshy ground coffee, that is, with no trace of anything green or musty. Second, the smoke should be quite intense, but shouldn´t "blow out", which means that it has burned. As it approaches the end of roasting, I open the roaster globe every 15 seconds to check out the beans. That´s the only really reliable way of knowing if it is roasted to our likeness. I even take some the beans out and check on the color. Remember that coffee beans inside the roaster keeps roasting even off the fire, and it will keep roasting more even after you spread over a sieve. That´s why we fan vigorously in attempt to stop roasting. I think you can try it in small batches until you learn what the signs are. Please write me back telling me of your experience. Good luck and good coffee!